Learn how to collect rollup data on specific services/operations using a Metrics Policy. Database Space Conservation: Roll-up data on a large number of services can take up a significant amount of database space. Designating specific services/operations where roll-up data will be captured reduces the chance of receiving out-of-memory database exception errors. Granular View of Service Activity: You might have a set of services that include specific operations you want to monitor at a more granular level (for example, to track service level or volume of activity). Roll-up data is controlled in the Network Director or Agent container by the following configuration setting: Akana Administration Console > Configuration > com.soa.metrics configuration category > metrics.rollup.reporter.requireMetricsPolicy property. By default, the metrics.rollup.reporter.requireMetricsPolicy property is set to False. This means that roll-up data is collected for all managed services in Policy Manager. Roll-up data can be viewed in the Logs, Real Time Charts, and Historical Charts in the Services > Monitoring section. To change the roll-up data collection approach, change the property state to True, create a Metrics Policy in the Policy Manager Management Console, and attach the policy to any service or service operation you would like to capture roll-up data for. Let's take a quick walkthrough of the Metrics Policy configuration process to get you started. Launch the Akana Administration Console for your Network Director or Agent container instance. In Configuration Categories on the left, choose com.soa.metrics. The default status of False indicates that roll-up data is currently being captured for all managed services. Change the state to True and save. 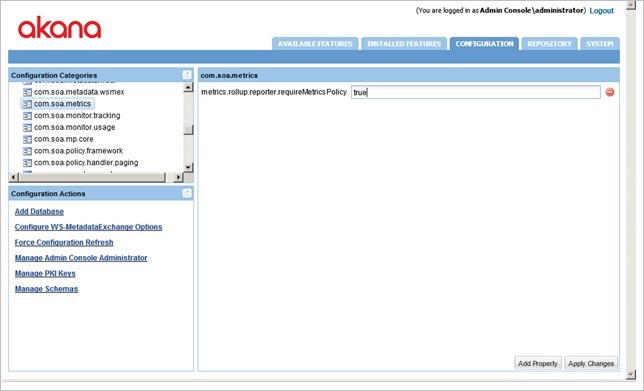 In Policy Manager, to create a Metrics policy instance, go to Policies > Operational Policies and choose Add Policy. Note: The Metrics Policy does not require any configuration. After you've attached the Metrics Policy to a service or operation, send a request to your service and go to the Services > Monitoring section to view the results for Logs, Real Time Charts, and Historical Charts. For more information on using the monitoring functions, refer to the Policy Manager Online Help, available via the Help button.